1. Choose a topic you are interested in. Develop a question on that topic. Check out the current state of research on this topic. What are international researchers saying? What are Canadian researchers saying? 2. 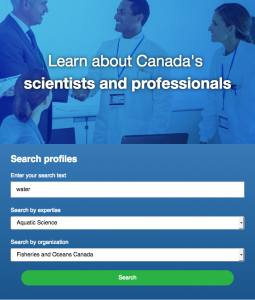 To find out what federal scientists in Canada are working on, go to the Canadian directory of federal scientists which is searchable by topic, area of expertise, and the organization supporting the research (e.g. Ministries, departments, etc). 3. Enter a search term and then use the drop down boxes to select which area of expertise and ministry that may be responsible for this research. (Your topic may fall under the purview of more than one ministry, so consider looking more broadly). Then press “search”. The more precise you can be in your selection, the better the results will be. The wider your search, the more scientists you will get. 4. a. A list of federal scientists who work on that topic will appear. Click on their names to learn about their research projects and the research papers they have written. If you think one or more of these scientists can answer your question, click the contact link. That will take you to the Government Electronic Directory Services where you will be able to search for that person’s name. 4. b. Sometimes your area of interest will not return any scientists. This means there are no active research projects or personnel dedicated to the topic. You can then direct your question to the federal Minister responsible for that area. A list of federal Ministers and Ministry critics is below. 5. When you click on the button to contact a scientist, you will be taken to the Government Electronic Directory Services. Insert the scientist’s name to retrieve his or her email address. Please also look up the federal Minister who oversees this researcher, so they can be alerted that this is an important area of research. A list of federal Ministers and Ministry critics is below. Don’t forget to CC us as well: write2knowproject@gmail.com. 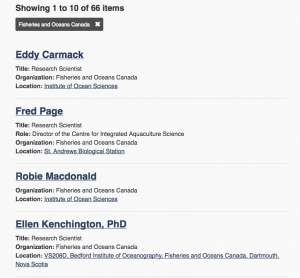 I am a resident of St. John’s, Newfoundland and am interested in fisheries. How will climate change affect the range of fish that can thrive in the waters around Newfoundland? Will there be fewer or different fish? I think your research on this is invaluable, especially given the needs and interests of my local community. Your work on the effects of water temperature on fish is of particular interest, and I would appreciate knowing your insights and findings. Can you share your data, reports, or outline your findings in an email? Thank you in advance. I am writing this email as part of Write2Know (http://write2know.ca) a letter-writing campaign that aims to mobilize public awareness and inquiry into federal research programs. We want to let you know that we value federal science and scientists, and that our questions arise out of genuine concerns about the health and well-being of Canadians. We remain concerned about the legacy of constraints on access to federal scientists and the results of their research, the elimination of essential research programs, and the closure of libraries and archives. These constraints and closures have impacted what Canadians can and cannot know about the health of their bodies, communities, and environments. We are hopeful that a new government will address our concerns. We are posing questions to federal scientists about their research and findings, and forwarding our letters to federal Ministers and Members of Parliament to call attention to serious gaps between scientific evidence and government policy. Please see the list of Members of Parliament. The list of Liberal Cabinet Members, including the ministers can be found here. *Critics include members of the main Opposition party and other parties responsible for holding the Government to account and for developing and disseminating their party’s policy positions. See the current “Shadow Cabinet” of the Conservative Party here. See the current “Shadow Cabinet of the NDP Party here.